It’s almost the end of August and I’ve definitely had fall on my mind (actually, fall has been on my mind since like july). I am so excited to pull out cosy sweaters and thick socks. New coats have always been one of my favorite things to pick as the weather gets colder. Since I grew up in San Francisco, coats have always been a necessity for me and I’m getting ready for the mornings to get chilly and the nights to get dark. It won’t bother me though because I will have a few cosy coats for fall. Check out a few that I’ve already added to my fall wish list. Ralph Lauren Trim Faux Leather Quilted Jacket – This jacket makes me feel like I should be on a foxhunt or something in the London countryside. I love the faux leather elbow patches! Banana Republic Military Jacket – I never thought I’d get on the military jacket trend until I saw this one. I love that it cinches at the waist and has these huge flap pockets. It’s perfect for the in between warm and cool weather days. 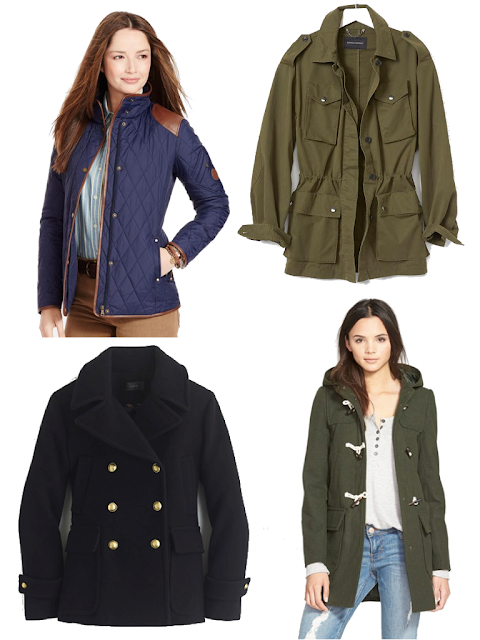 J.Crew Stadium Cloth Majesty Peacoat – A classic peacoat is the perfect fall accessory. I feel like it’s a staple for every girl’s wardrobe. If you don’t have one, then it’s definitely time. Thread & Supply Toggle Jacket – Two words, hunter green. I love the foresty color of this hooded toggle coat. It’s also a huge bonus that it has a hood. Fall, I am so coat ready for you! Have you picked out a new coat for fall? Military jackets – all day every day. I am so excited to utilize my military vest this fall! I also love a good anorak. And the peacoat – of course! J.Crew has such great quality ones. Love your coat selections esp. Ralph Lauren, JCrew, and Thread and Supply! I love pea coats they are a classic must have…I have one in my closet! I can't wait for coat shopping! Such great picks, girl! I love having as many coats and sweaters as possible in the fall! You can't go wrong! Love these! Can't wait for fall shopping!